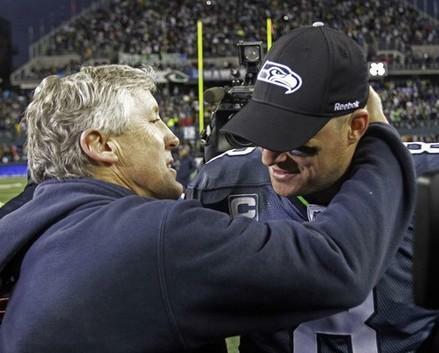 Love 'em or leave 'em: Matt Hasselbeck hugs coach Pete Carroll after the Seahawks beat the Saints in the NFC Wildcard playoff game Jan. 8, 2011. Art Thiel says Hasselbeck will be a free agent whenever NFL players get a new contract. After 10 years with the Seahawks, Hasselbeck's contract is up. Both he and the team have expressed a desire to have him stay in Seattle. But Nate Davis with USA Today reported that Hasselbeck had rejected the team's latest offer. KPLU sports commentator Art Thiel says Hasselbeck could still play for the Seahawks next season, but the team is now going to have to negotiate with him along with all other interested parties. "He could wind up in the NFC rivals with Arizona or San Francisco, which would be mortally weird for a lot of Seahawks fans after a decade of seeing Matt. But the [Seahawks] had the chance and now he's subject to the market." Art says no conversations with Hasselbeck will happen until a new collective bargaining agreement is reached with the players' union. Art says the players gained leverage last week when a federal judge invalidated the owners' $4 billion strike contingency fund, which came from the television networks. That forced the owners to make some kind of altered offer. When Art and I discussed the NFL labor talks last month, he said both sides had legitimate issues. The owners want a cap on rookie wages. 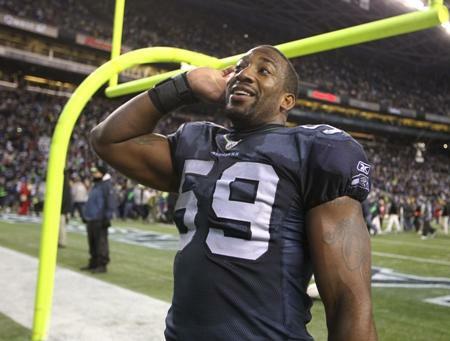 Art says Seahawks linebacker Aaron Curry is a prime example of why. Curry was the fourth pick overall in the 2009 draft and signed a $60 million/5 year contract. Art called that "ridiculous" and says Curry will never live up to that kind of money. He said the rookie wage issue needs to be resolved or it will ruin player payroll scales. But Art added that, with $9 billion in annual revenue, the NFL owners can't claim they're in financial peril and lock out the players. The players are fighting the owners' plan to extend the season by two games (from 16 regular season games to 18, taking away two exhibition games). The players say the season is grueling enough - both mentally and physically - and they don't want to play any additional games. NFL owners want to get cost certainty on the labor front because they're putting a lot of their money into a fund to help subsidize the building of new stadiums, so they don't have to ask the public for money. In a weekly Q&A, Seattle sports expert and longtime columnist Art Thiel gives his take on the latest regional and national sports news. “Sports with Art Thiel” is published here and airs on KPLU 88.5 every Friday during Morning Edition and on Weekend Saturday Edition.